For the fifth of its eight rounds the FIA World Endurance Championship (WEC) heads to Fuji, Japan. As the 2015 season heads onto the finish straight, Earl Bamber’s campaign takes him from one finale to the next. Nine drivers, one objective: to become the scholarship driver in the Porsche Mobil 1 Supercup. After a long time in the lead in the race the two 919 Hybrid finished fourth and fifth in Austin. The Porsche Team, with the two 919 Hybrids, enjoyed a smooth first free practice session. Michael Ammermüller has claimed two victories at the Porsche Carrera Cup Deutschland on this weekend. At the Circuit of the Americas in Austin/Texas, the WEC picks up momentum again on 20 September. Porsche is pleased with the results of its third and final track test with the 919 Hybrid. The Porsche North America works team fields a third Porsche 911 RSR for the first time this season. At round eight of the championship in Monza the Porsche junior Sven Müller scored his first win. 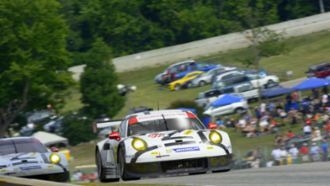 The Porsche Manthey squad has rearranged the team line-up in its two Porsche 911 RSR.